KNOXVILLE, Tenn. -- After a hard push by UCLA, Rick Barnes has decided to remain the men's basketball coach at Tennessee. "The last few days have been interesting, to say the least," Tennessee director of athletics Phillip Fulmer said in a statement. 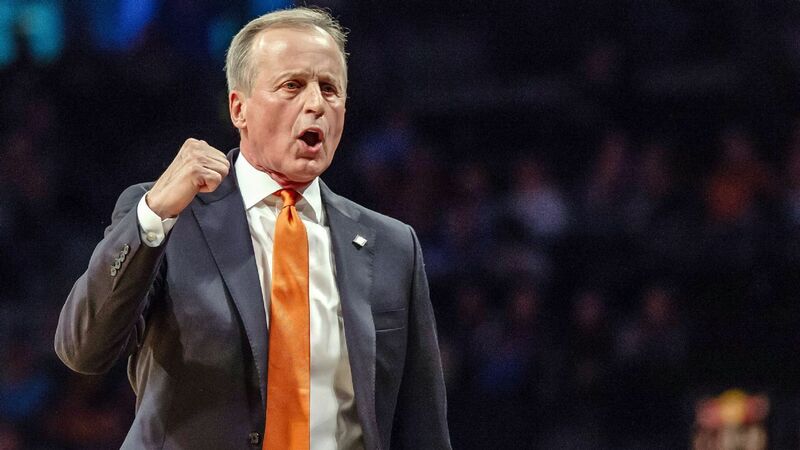 "One of the nation's most tradition-rich college basketball programs identified what we here at Tennessee already knew -- that Rick Barnes is one the game's elite coaches and a program-changer." Fulmer added: "The University of Tennessee and East Tennessee as a whole have developed an enhanced love and appreciation for our men's basketball program and its culture under Rick's leadership, and I'm thrilled that he will remain a part of our Tennessee Athletics family." UCLA began aggressively pursuing Barnes last week with a lucrative package that would have paid him $5 million a year, not counting bonuses and incentives, sources told ESPN. Barnes was named Naismith Coach of the Year on Sunday and met with Fulmer later that evening, according to sources. Barnes finalized his decision to stay as the Vols' coach on Monday night after Tennessee countered with a new deal that was in the neighborhood of what UCLA was offering. Barnes' buyout to get out of his contract at Tennessee was $5 million, sources said. Barnes has been at Tennessee since the 2015-16 season and led the Vols to the Sweet 16 this season and a share of the SEC championship a year ago. He took Tennessee to a No. 1 ranking in the polls for a month this season. Sources close to Barnes said it was a tough decision for him, especially given the opportunity to return UCLA to its past glory and finish his career at such a tradition-laden basketball school. But Barnes, who will turn 65 in July, enjoys living in east Tennessee and is extremely active in the community. He has taken the Vols from 15 wins his first season in Knoxville to 31 this season, which matched a school record. They also won a school-record 19 straight games this season from Nov. 28 through Feb. 13. All six of their losses were to NCAA tournament teams. Barnes signed a contract extension in September at Tennessee running through the 2024 season that paid him $3.25 million this season and was scheduled to increase by $100,000 each year of the deal until reaching $3.75 million in 2024. One of the things Barnes has always put a premium on is his assistants and staff being taken care of financially and providing as much security for them as possible, which was paramount in his talks with UCLA and ultimately his decision to stay at Tennessee. Barnes informed Fulmer late last week that UCLA had interest and wanted to make sure he talked personally with Fulmer before reaching any decision, sources told ESPN.